Jordan Peele has enlisted some big names for his next film. 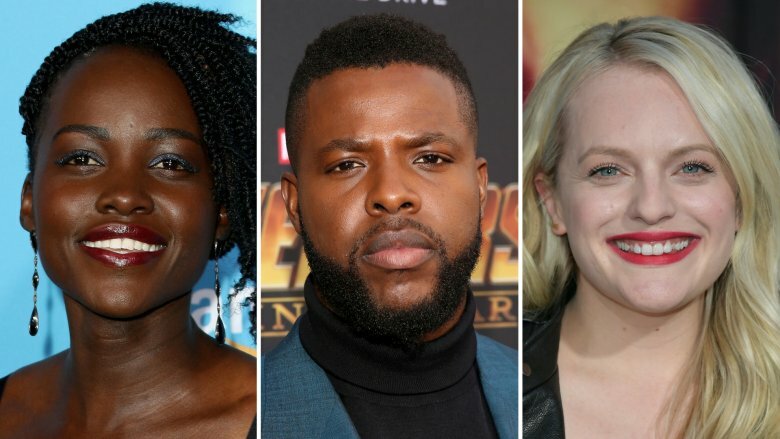 According to Variety, the Get Out director has Lupita Nyong'o, Winston Duke, and Elisabeth Moss in various stages of talks to star in his next movie, titled Us. Peele shared the title of the movie on his social media pages on Tuesday, along with a poster featuring two silhouettes on a marbled background. The poster reveals that the "new nightmare" is slated to hit theaters in March of 2019. Although details of the film's plot are being kept tightly under wraps, The Hollywood Reporter notes that it is set to follow two couples, one black, played by Nyong'o and Duke, and one white, played in part by Moss. Nyong'o is said to be in negotiations for the role, while Duke and Moss are in earlier stages of potential deals. Nyong'o won an Oscar for her performance in 2013's 12 Years A Slave. She recently made her debut appearance in the MCU in the box office juggernaut Black Panther. The actress' other upcoming roles include the zombie comedy Little Monsters, a remake of John Woo's action film The Killer, and the Simon Kingberg-directed thriller 355. She has also been rumored to be starring in Elizabeth Banks' planned Charlie's Angels reboot. Duke, meanwhile, had his big breakout with the memorable role of W'Kabi in Black Panther. Duke, who attended Yale University's drama school with Nyong'o (via Esquire), also reprised his role in Avengers: Infinity War. Prior to joining the MCU, the actor was known for Person of Interest and had booked appearances on the TV shows The Messengers, Major Crimes, Modern Family, and Law and Order: Special Victims Unit. Moss took home her second Golden Globe earlier this year for her starring role on Hulu's The Handmaid's Tale, which she also produces. Her first trophy was for the miniseries Top of the Lake; she also holds a nomination, as well as six Emmy nominations, for her role as Peggy Olson on the AMC series Mad Men. Moss' upcoming roles include the Alex Ross Perry rocker drama Her Smell and the dramatic mob piece The Kitchen. Peele saw huge success with his low budget 2017 horror flick Get Out, which made $255 million at the worldwide box office (via Box Office Mojo) and earned Oscar nominations for Best Picture, Best Lead Actor for its star Daniel Kaluuya, and Best Director for Peele. Peele took home the coveted trophy for Best Original Screenplay. Peele is set to return once again to write and direct Us; he will also produce the film for Monkeypaw Pictures alongside Sean McKittrick (Donnie Darko), Jason Blum (Paranormal Activity), and Monkeypaw's Ian Cooper. Us will debut on March 15, 2019.